Some consider wind turbines to be garish blips on serene landscapes. Not so with this Windstalk concept, which utilizes a series of 1203 kinetic energy-generating “stalks” to harness power. 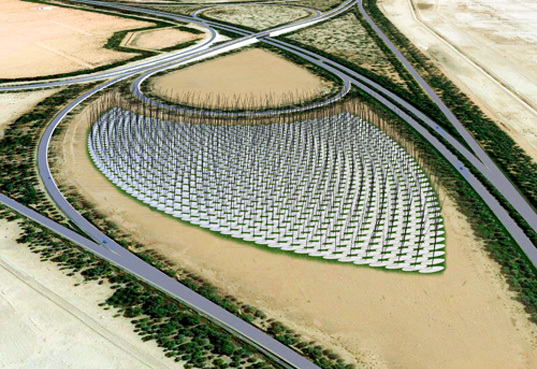 Designed for Abu Dhabi‘s Masdar city, the project takes its inspiration from the way wheat fields blow in the wind. 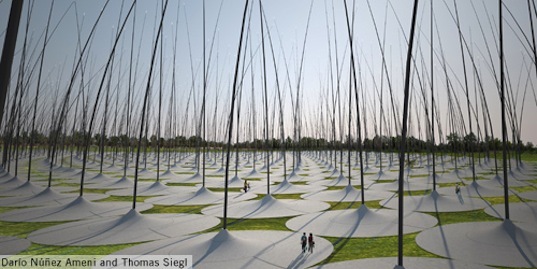 The 55 meter-high stalks, which are made of carbon fiber-reinforced resin poles, contain piezeoelectric discs and electrodes that generate current. The current is stored in two chambers that act as a battery. LED lights placed on the pole tips glow or dim depending on how much wind is present. When wind is completely absent, the LEDs stay dark. The Windstalk remains a concept, although its creators say that “It is based on a set of systems that already exist and work.” No word on how much energy a field of Windstalks could create, but we’re guessing it requires a lot of land to generate a significant amount of power. The question still remains as to energy created v cost to create, and what is the cost in pollution. Look at windmills which use magnets made with rare earths which are killing the people who mine and separate them, as well as their environment. While we need alternate sources of energy, we need to look at all the costs before jumping in and creating more problems. How about strings of these along the medians of Interstate highways? Can't put such land to any use, but it has to be mowed and kept clean. WOW! I did not know abut windstalks.......what an innovative idea.and yes, definitely prettier than the turbines.I live in So Cal, so I know..Brilliant! Some consider wind turbines to be garish blips on serene landscapes. 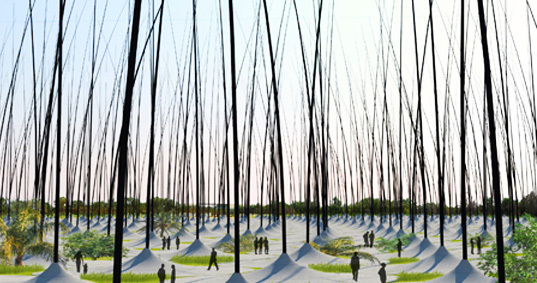 Not so with this Windstalk concept, which utilizes a series of 1203 kinetic energy-generating "stalks" to harness power. Designed for Abu Dhabi's Masdar city, the project takes its inspiration from the way wheat fields blow in the wind.